I’ve come up with a new idea on how to present some information about decks when the amount of actionable information for the finance side of Modern Magic is low. Once in a while I’m planning to write, what I’m going to call, a “Financial Deck Tech.” In these articles I’ll discuss the costs of buying and maintaining a specific deck, as well as the best strategies to acquire it over time. I’m going to start with Dredge because it recently won the Star City Games Modern Classic and Invitational in Atlanta. Dredge is definitely a veteran’s deck. It’s operates on a very unorthodox axis and has a lot of complexity in its operations. As a result, I generally think it’s a poor choice for someone newer to Modern, or Magic in general. It’s also one of the few decks that has pretty egregious physical dexterity requirements. There is a huge difference between a player with a reasonably organized graveyard and a messy pile. Dredge is also a deck that can be fairly easily hated out via sideboard cards. If your plan is to play this at a local card shop for months at a time, you will have probably have to get used to a wide range of graveyard-hosing sideboard cards. Dredge is similar to Affinity in the ways that it operates after sideboards are introduced—but the best anti-Affinity sideboard cards are colored and thus unavailable to every deck. Dredge has a lot of people complaining about its speed and low amount of interaction. I wouldn’t be surprised to see it brought down a notch via a banning in the next six to twelve months. As far as new cards in the pipeline, we only know that the next block coming out is a new plane. Amonkhet has a Nicol Bolas dynasty overlaid on an Egyptian theme. Due to the fact that mummification and the dead are such a big part of pop-culture Egypt, I would not be surprised to see some new cards that interact with the graveyard and bring more power to Dredge. With that in mind, please don’t assume we will get some insane graveyard cards to make Dredge unstoppable. Kaladesh is an artifact-themed set where the best cards from Modern were a red sorcery and a green pump spell. On the other hand, Dredge is unlikely to get much worse than it is now, unless a lot more maindeckable graveyard hate cards get printed, or something weird happens like Deathrite Shaman getting unbanned. The core of a deck are those cards you absolutely need to play, where substitutions are likely impossible and copies of these cards are included almost universally across decklists. For example, the cards that are most definitely part of the core of Dredge are Insolent Neonate, Bloodghast, Prized Amalgam, Narcomoeba, Golgari Grave-Troll, Stinkweed Imp, Conflagrate, Faithless Looting, and Cathartic Reunion. There are many other cards that will usually make the cut in lists that are of less interest to us here. First of all, different players may be drawn to different versions, and second of all these non-core cards can change in response to metagame shifts, new printings, and more. For our purposes, this includes sideboard cards. The core of Dredge is relatively inexpensive compared to other Modern decks. The 35 most important cards in the deck come to approximately $192.50, which includes 4 Bloodghast ($25/each) at the top. That’s pretty good for a Modern deck, which can often be bogged down by a few extremely expensive cards. For less than the cost of just the Noble Hierarchs in Infect, you can finish almost half of the maindeck of Dredge. In fact, most of the rest of the deck’s cost is in building an optimal manabase, which can be substituted with less expensive versions. At a minimum, you want to purchase the entire core of Dredge before going forward. Incremental upgrades can be made after that. Far and away the best thing to buy first is Bloodghast. It’s on the harder side of things to reprint, due to a fairly unique mechanic, and it’s also played in a lot more brews than Golgari Grave-Troll. Granted, anything on this list could be reprinted at any time, but I think it’s not likely to. We could get it as a promo (like the Inkmoth Nexus in the pipeline) but those are also particularly difficult to predict. After that, I would recommend making sure you have the cheap commons and uncommons. If you or your friends have played Standard or drafted in the last six months, somebody probably has some Insolent Neonates and Cathartic Reunions. 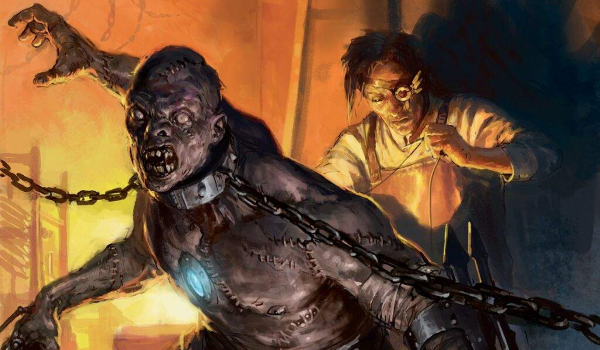 Faithless Looting was reprinted in Eternal Masters, which is getting another printing to end the year. If you’re just sitting around your LGS, don’t be afraid to ask people drafting Eternal Masters if you can thumb through their bulk for a few Lootings. Stinkweed Imp is also pretty cheap despite being fairly old. I’d recommend getting those when you see them. Conflagrate is a difficult card to evaluate because we don’t know the mechanics in Modern Masters 2017 yet. It’s probable that they put in flashback because it’s a popular draft mechanic and presumably they want to reprint Snapcaster Mage. But that doesn’t guarantee that they noticed Conflagrate as a weird Time Spiral block uncommon that needed a reprint. I wouldn’t buy them until I was done with the rest of the core. Golgari Grave-Troll is the second most expensive card in the deck and was already reprinted once in the Izzet vs. Golgari duel deck. That being said, I can’t see a place where it gets reprinted in the near future. The dredge mechanic was already used in the first Modern Masters set, and it’s not terribly loved in Limited. My gut says the chances that Grave-Troll gets printed again are low and it’s a pretty integral part of the deck. Narcomoeba is a weird card (man, a lot of this deck is really odd, huh?) that also probably won’t be reprinted unless it’s alongside the dredge mechanic. It’s pretty abysmal in draft as a two-mana 1/1 flyer. At $3 you can wait for Modern Masters or get them now. It is unlikely to matter. The last card is Prized Amalgam. I’m not sure how much of this card’s price is due to Standard (where it’s playable, if not very good in my opinion) and how much of it is due to Modern. Standard prices are pretty volatile, so I would say the latest I would wait to buy them is right before spoiler season for Amonkhet. 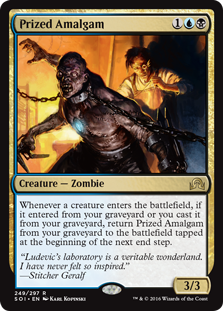 If they spoil any insane Zombie (Mummy) thing that can come back from the graveyard, it could cause a run on Amalgams for Standard play. While the Dredge manabase is not particularly expensive since it doesn’t need access to Zendikar fetchlands, it still comprises about half of the cost of the deck. Blackcleave Cliffs and Copperline Gorge are the easiest lands to replace with cheaper, less optimal versions. Blood Crypt ($7), Stomping Ground ($12), Sulfurous Springs ($4), and Karplusan Forest ($2) are reasonable replacements, and for the most part the extra life lost won’t cost you too many games. 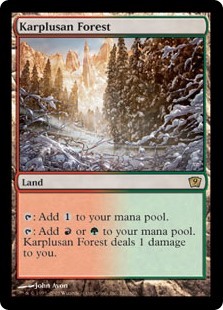 While it’s not standard in every Dredge list, you can also substitute some cheap Mountain fetchlands—Wooded Foothills ($15) and Bloodstained Mire ($13)—to make your Bloodghasts better. Past these more expensive fast lands, Gemstone Mine and Mana Confluence are typically played. While they’re not that expensive, if you want to save a few more bucks you can play City of Brass ($3) instead. I wouldn’t recommend it, however, since they’re only a few dollars cheaper than Confluence and Mine ($2 and $5 less, respectively), and City of Brass isn’t really played in any other Modern deck. The last land I want to talk about is Dakmor Salvage. If you’ve never played Dredge before you might think that land is optional, but it’s really not. It’s not particularly expensive and I would have included it in the core of the deck, but the reality is that it’s not strictly necessary. In my experience, however, you probably shouldn’t cut it. If you’ve managed to avoid picking up the fast lands from Scars of Mirrodin, I would continue to wait until we start to see spoilers from Modern Masters 2017. We haven’t seen a ton of dual lands in Masters sets yet, but the fast lands might just be a small enough cycle to sneak in. Blackcleave Cliffs in particular had a large price spike when Modern Masters 2015 was released, making it likely on radar for a reprint. I would not recommend purchasing any of the expensive sideboard cards until you figure out what your local metagame looks like. Even though you can use our metagame analysis to predict some amount of what to expect, nothing is better than actually going to your LGS and playing. It’s possible you don’t need the Thoughtseizes that are in the sideboard of Baugh and Scherer’s decklist from the Invitational weekend if there aren’t a lot of combo decks. Before closing, I’d like to touch on Inkmoth Nexus. It was recently spoiled by an unofficial source as the promo card for the WMCQs (World Magic Cup Qualifiers) next year. These promos are not typically released in large quantities, and past ones started out pretty expensive. Last year’s promo was Abrupt Decay, which can now be found for about $35 on TCGPlayer. Normally there isn’t a lot of information to glean from promos, but in this case it seems almost impossible that Wizards would undercut the excitement generated by such a high-profile promo with a reprint right beforehand. A lot of people have pointed to the recent Judge promos in Eternal Masters, but the difference is that those came out before the set release. Modern Masters 2017 will be released in March of next year; the WMCQ dates haven’t been announced yet, but this year they were in June, July, and September. 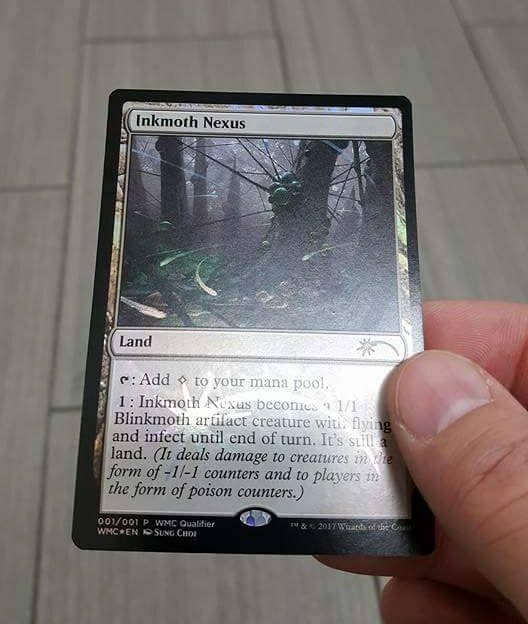 Putting a reprint of Inkmoth Nexus in Modern Masters 2017 seems almost against the very idea of the promo. Another point against Inkmoth Nexus being reprinted in Modern Masters 2017 is the number of draft slots they need to support an infect strategy. Given the fact that the most popular cards with the mechanic are both $1 commons (Blighted Agent and Glistener Elf), there’s not a lot of incentive to squeeze infect into Modern Masters 2017. My final judgment, given the evidence presented, is that I’m fairly certain we won’t see Inkmoth Nexus appear in Modern Masters 2017. I hope you enjoyed this “financial deck tech,” as I’m calling it. If you are interested in seeing more, which decks would you like me to cover? Please leave a comment below and I’ll try to get one of these done every couple weeks. If you didn’t like it, also let me know below. I’m interested in knowing your questions and opinions on what you would like to read from my column. I really enjoyed the way you presented this information. I think it was one of the most catching financial articles yet, especially the part where you defined what the core of the deck is and how much it would cost to achieve. Having said that, you and I are both Burn players at heart, so I’d love to see the actual breakdown of what is traditionally the “beginner’s” deck from a money perspective. Perhaps a small note of the chances of Goblin Guide being reprinted in MM17? This was pretty helpful, and I would like to see more articles like this in the future. Shouldnt you wait for mm17 at this point to see if bloodghast gets a reprint? Was surprised it was your top card to buy when it seems like a very plausible reprint. So it is a safe buy despite being expensive because he believes it is a less likely reprint. Gotta bear in mind WOTC looks at modern masters not only as a reprint set for constructed players but a cool draft environment to sell it to limited players as well. Keep in mind, this is Jim’s (informed) opinion, but it’s not fool-proof. I agree with him that a dredge theme in draft is unlikely, but it’s certainly not impossible. Ultimately all this stuff comes down to the concept of “risk”—what he’s saying is that the buy-in on Grave-Troll is worth it in his estimation, but as with all forms of investing you want to be diversified across lots of specs so as not to get totally screwed by a missed prediction. Tl;dr: There’s basically no such thing as a “safe” spec. A very fair point, Jason. I simply was pointing out that Jim did, in fact, offer an explanation as to why he would suggest someone buy it now. Hey everything comes with risk. I am still crossing my fingers WOTC releases “Goyf Masters,” a set where every pack features a tarmogoyf guaranteed. Anything is possible but not everything is probable. It’s probable that the cards that were chosen to be reprinted in MM17 were chosen over a year ago. Bloodghast was a $12 rare until Shadows over Innistrad this year. They also don’t like putting one keyworded card in a set. Exalted had 3 cards in MM15 which is probably the minimum. I’d say the chance of bloodghast getting reprinted is pretty low due to how much support the set needs for landfall as a mechanic and the lower price of the card at the time. I assumed he meant difficult to reprint in a standard-legal set. Keyword means nothing to getting printed in supplemental product (not the question here but still) and very little to getting printed in modern masters – these sets routinely support like a dozen keywords and as per Jim’s comment can have as few as 3 cards with the word on it. The game design team just did landfall in BFZ. Set design starts roughly 2 years ahead of a set release. They knew that they had just done BFZ when they started this set, so my assumption would be that landfall wouldn’t happen in MM17, which is a draft set. Mostly because its boring game design space. So if it does get a reprint it would probably be in the rare slot since its not really a chase modern card. But the rare slot is usually focused around draft mechanics more than the mythic slot. That’s what makes Bloodghast an unlikely printing in this set to me. If they do put it at mythic (I’d be surprised), then we’ll see the tarmogoyf effect on the price of it because originally a rare, reprinted at mythic, for a deck that is inexpensive leads to the “oh! Now I just need 3 more of these!” which would in the long run lead to a price increase on the card and on the rest of dredge. The rest of dredge’s price is also likely to go up in the event that Bloodghast sees a reprint at rare. The card is a casual all-star, so its price probably won’t ever hit bulk. Its been on a steady incline for a long time. The card is brewed with all the time. It is used in any deck that abuses creature recursion in EDH. Its a great card that didn’t have a home in modern before now. Even if you buy in at $25, and dredge stays tier 1, GGT will probably climb in price to offset your loss on bloodghast (assuming only 1 of them gets printed). And Bloodghast will probably not stay super low forever. I’m in the “if you want to play the deck, just buy the card” camp. Don’t speculate on it, because that ship has sailed (if you wanted to spec on Bloodghast you should have done it at $10 because of its casual appeal and the fact that people have been trying to make dredge a thing in modern for so long). But if you buy the whole deck, you probably won’t take a huge hit on the entirety of the collection unless BOTH GGT and Bloodghast get a reprint in MM17… which I would doubt. If the deck doesn’t get banned in January, and Bloodghast doesn’t see a reprint in MM17, expect the card to continue to climb. For the record, I think this is the most likely outcome. All told I just think its unwise to buy anything expensive in Modern right before a new masters set comes out. It’s impossible to really predict what wizards will do with these – we did not get serum visions or goblin guide in MM15 which felt like locks the same way Liliana of the Veil and Snapcaster Mage feel for MM17. Wizards hasn’t printed land cycles before – but who’s to say fetchlands or enemy fastlands don’t make the cut for Mm17? Too hard to predict, safe bet is to wait for spoiler season to buy anything pricey just to be safe. As soon as what you want is alphabetically/mathematically out of the picture scoop them up immediately before they can spike. And a very good point in regards to bloodghast. What drives me away from buying into most decks is what I call the “money card.” Every tier one deck has one or two cards that are $30+ each and always require a full playset. Karn in Tron, Mox Opal in Affinity, anything with Goyf or Hierarch…yeah. With things like fetchlands and old fastlands I’m generally more okay with it because a playset of polluted delta can be played in a lot of decks. That money card, man that’s a commitment to a strategy. I would hate to buy a playset of Snapcaster Mages only to find out I actually hate playing Grixis Control after six months. Maybe I’m just scared of commitment even in MTG haha.